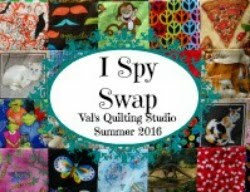 Val's Quilting Studio : Three Scrappy Projects! 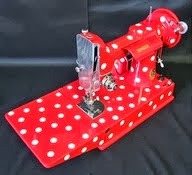 I'm always so inspired by Cynthia who blogs at: Quilting Is More Fun Than Housework. 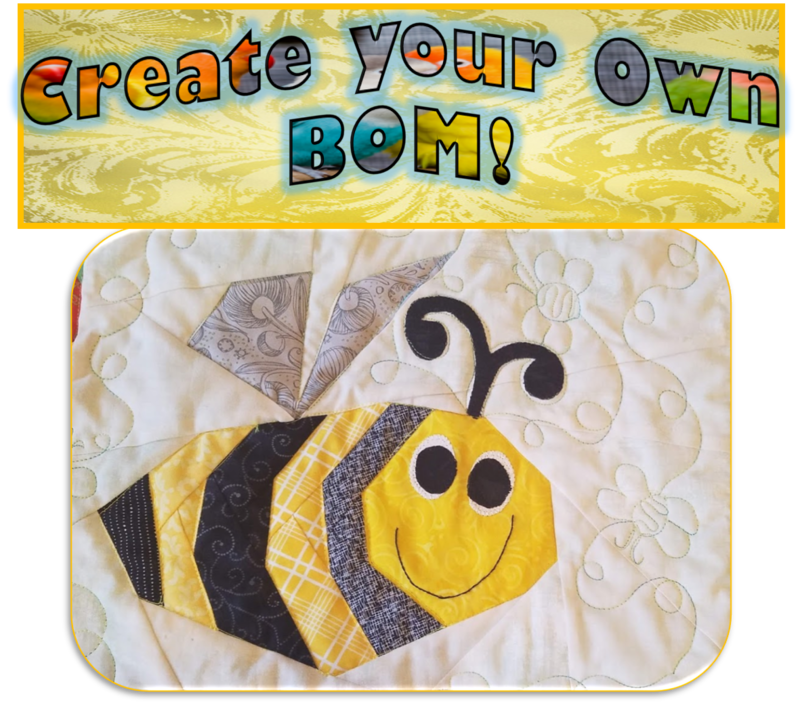 I visit her Scrap Palooza Quilt Gallery often and am motivated weekly by her Oh Scrap! Linky. So imagine my surprise when SHE asked if I'd highlight some of my scrappy projects!! Whoot! Woo! You bet! Thank you Cynthia! So I started 2015 with no "real" quilting goals, yet it is beginning to look like this is going to be my year to get some rainbow scrappy quilts done! Yep! Upon creating this post, I realize I have three very bright WIP that I plan to use Cynthia's weekly linky to motivate me to get them done! Project #1: My Rainbow Hexagons! ...this rainbow of hexagons! They are back on the design wall. I'm busy "auditioning" what color I'll put them together with?? (I don't like the white.) Any suggestions? I also have a set of red that aren't on the design wall...yet. Project #2: My Rainbow Neighborhood! I started these scrappy dolls and houses for my RSC13 challenge last year. I can not tell you how much fun I had each month digging through my scrap boxes and putting them together "free style". They too are back on the design wall. I plan to fill in the gaps and get them sewn together all wonky like this. I'm then going to add some appliqued flowers, trees and who knows what else to create a fun little neighborhood! (I think I need to add a Jackson next to one of the houses too!! LOL!) Oh I can't wait to get back to these. I just really enjoy adding scraps of ribbon, rik-rac, buttons and lace and well, pretty much anything else laying around the sewing room to these! If you are new to my blog this week, THAT is Jackson in the picture! My Jack Russell buddy! Oh! I had so much fun dumping my bin of scraps back in February and creating that "made fabric"you see in the pinwheels above! Have you ever done that? 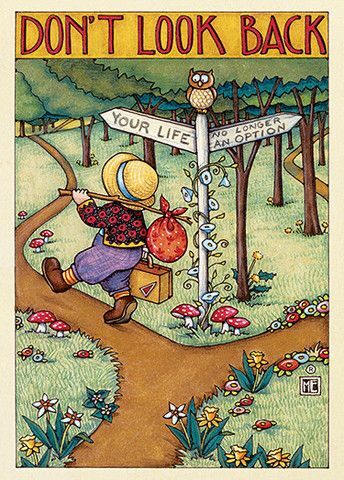 It's so liberating to just dump your box of scraps and go for it! It's easy to say, my rainbow stash of scraps is depleted after creating these three quilt tops. Now it's time to get them done! I can't wait to get back to them and look forward to sharing my progress and finishes each week at Cynthia's Oh Scrap! Sunday Linky!! Thanks for stopping by and seeing my rainbow of scrappy WIP! I hope if you are new to blog from Cynthia's, that you'll hang around and make yourself a follower! I'd love to get to know ya! I love your buckets hanging on the hooks above your sewing station. If I were a little more permanent in my housing, I think that is a perfect set up. I am a dumper too - although I dump on the table as the bending to the floor would wipe me out. Glad to see you brought the houses and people back out - that quilt needs to be finished this year. I agree...thanks for the encouragement Sharon!! Scraps, hexagons, free piecing and bright colours, that's just me. 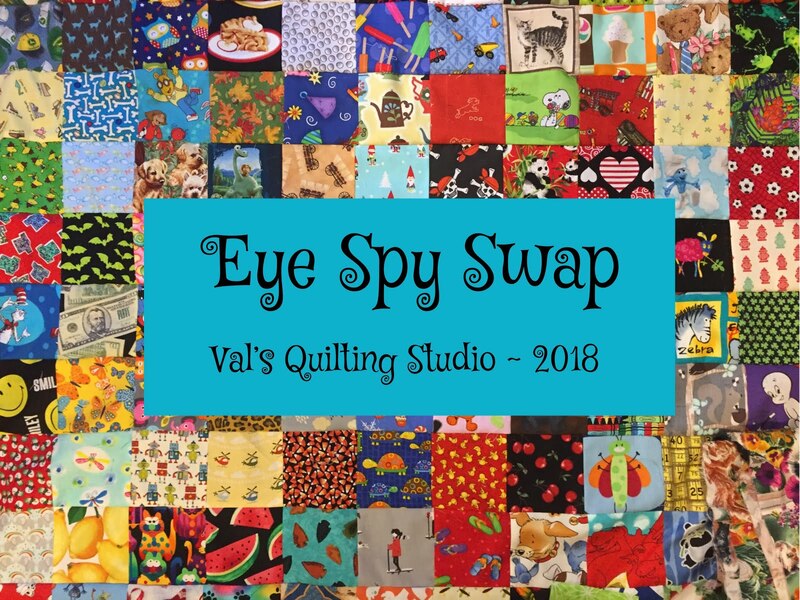 You make my dream quilts, Val. Maybe you should try black with your hexies. Black makes the other colours pop. I love your neighborhood, and would really like to be a part of it. I'd like to dive in your scraps. Thanks for the inspiration. Great scrap projects, you use up every piece with those blocks. On the hexies, have you considered a light grey, a charcoal gray, or black? Black or grey would look great with the bits of black in the hexies. A solid will let the hexies shine. Jackson seems to like your pinwheels. Give him a big hug for me! You have used your scraps perfectly! Love the hexagons, but those little scrappy dolls are my favorite! I think your hexies would be great with a low volume background!! You have some great scraps. I love how you have pieced them into the HSTs for the pinwheels. It will be interesting to see how you finish the rainbow neighborhood. I'm off to Cynthia's now to see more scrappy goodness. Thanks for introducing me to her blog. here we are both thinking about hexies! I wonder how you'd like to just put "flower" next to flower with no spacers. Your rainbow hexagons are fantastic! I'd go with something dark for your rainbow hexies. I think they'd look really stunning against dark navy or black. I love using dark backgrounds as I find it makes colours pop so much better than white. Thanks Val for sharing all your wonderful scrappy projects with Oh Scrap! Your neighborhood quilt is a favorite of mine. And for the hexagonal, I would consider a gray. It will be great to see these projects in process again. Three wonderful projects! Love those pinwheels. I am building up my rainbow scraps so that I can make some cute projects like this. :) I think a gray would look good as a background. I love your rainbow hexie's!! How about just using a solid white hexie(not pieced) in place of your white strippy ones? Such great scrappy goodness going on there. It must be Jackson who gets you going... I need an inspiration dog. LOL. Your three quilts-to-be have just enticed me into following you, as I love them all! The pinwheel with made fabrics has jumped on my want-to-make-one list (in spite of it already being too long) and the others will likely join it there. Definitely add a Jackson to the neighborhood; he'll be the perfect bit of extra zing. I luv luv luv scrappy quilts! But I am being very hard line with myself...I can't get them out and play until I finish up a stack of other projects. My sewing room is just too tiny to handle any more at the moment, lol! All of your scrap projects are fabulous! I tried tackling my scrap box the other day and I just wasn't in the right mood. You're projects are inspiring me to give it another try! I think you could use a soft pink for your background instead of a traditional neutral. It would be lively and fun, and not dull (kill) the other colours. You have received many suggestions - I'll be interested to see what you do! Love your red bucket set up! Great idea and you really know how to work with scraps! I love all three and I am looking forward to seeing Jackson in your neighborhood. You have quite a pile of scraps, get busy girl! LOL! Luckily that pile of scraps is gone now!! Whew! What a fun post! Love the rainbow hexagons--was thinking maybe a black center might work for the centers--only a thought! Your Rainbow Neighborhood and Pinwheels are great as well! Thank You for all the Inspiration! You know I love hexagons so this scrap quilt is in my wheelhouse! You certainly have a healthy pile of scraps! Love all 3 of your scrappy projects. I too am a scrappy quilter. I will be back to check out how you are progressing on your UFOs you can bet! Each one of these quilts is a barrel full of scrappy fun Val - they make a person smile to look at them! Love all of them! You just have to add a Jackson to your neighborhood - after all, Jack Russells are very scrappy! I liked the strip pieced white hexies in the background, but if you don't, then perhaps a neat low volume fabric, like this awesome mad scientist themed one at Fabric Worm: http://www.fabricworm.com/regiforbiorf13.html It seems in keeping with crazy scrappy hexies. 3 great scrappy projects with lots of bright colors makes for one fun blog post! Love it. Those hexies are so eye catching laid out that way.